A map of Vinewood, Los Santos in Grand Theft Auto: San Andreas. 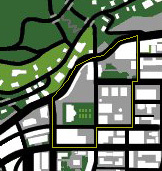 The area of Vinewood is located within the yellow border. This is a screenshot of a map of Grand Theft Auto: San Andreas - a copyrighted video game developed and published by Rockstar Games. current 15:40, 17 November 2010 162 × 171 (49 KB) ZS (talk | contribs) Manual copy from GTA Wikia. This page was last modified on 11 May 2014, at 11:54.